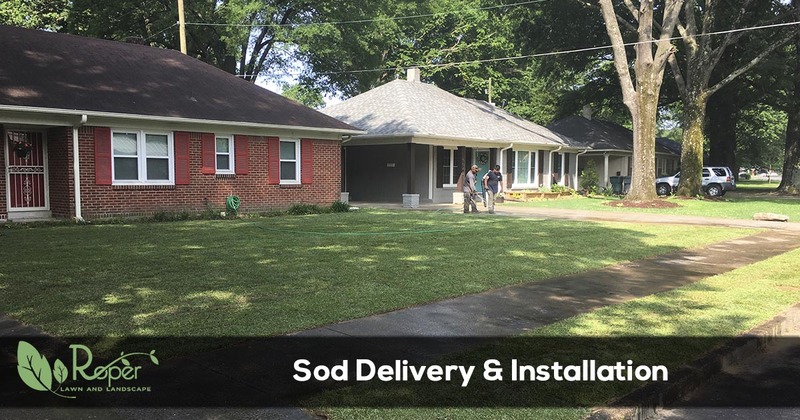 For affordable sod delivery and installation services in the Memphis, Germantown, Cordova, Collierville, Bartlett, Lakeland and the Arlington Tennessee area call Roper Lawn & Landscape. Roper Lawn & Landscape offers a variety of grass types for you to choose from based on your needs or existing grass. We offer Bermuda Grass & Zoysia Grass. A warm season turf that grows quickly and requires moderate maintenance. Bermuda is dense, and medium to fine textured. It grows well in full sun and is heat and drought resistant. Bermuda recovers quickly from heavy foot traffic. A warm season turf with wide blades and a soft texture. Empire Zoysia adapts to a wide range of soil types and requires less maintenance than most grasses. It has a slower growth rate than bermuda, and is more tolerant to shade. ‍A warm season turf with a rich, dark color. Meyer Zoysia has a high tolerance to shade. It requires less maintenance than the other grasses offered. Ready to schedule your mulch delivery and installation services or just need to get a quote? Give us a call at 901-290-8165 or request a quote online. We give quotes fast and make scheduling easy.